Frosty morning. Doetinchem, The Netherlands. Frisse morgen. Doetinchem, The Netherlands. Littlebit of sunshie today, ... took my changes with it. Think it turned out quite well. Soo cold yesterday, ... only the chillfactor tho. 't Veldhoen. Doetinchem, The Netherlands. Splendid afternoon, ... what a light during those winterdays. just too dark so I have to take one with artificial light which I don't really like. Oliebollen, ... don't know if anyone outside The Netherlands know what they are. Now that was fun today, ... grey but fun. Almost as nice as allotments, ... no AS nice as allotments!! A nice but rather cold day in Deventer. 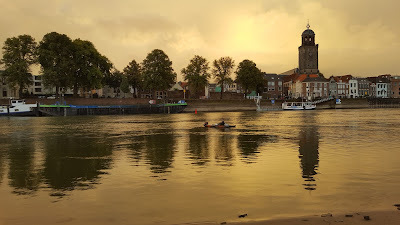 Although Deventer is on the other side of the river IJssel.Anyhow it was quite grey. I'm planning to annouce each Wednesday or Thursday where I'm heading the next Wednesday to paint. Feel free to join, ussually I'm starting off with a cuppa in a pub or restaurant at 10:00 o clock. Next week (Wednesday the 17th.) it will be 's Heerenbergh at the castle it self. I'm going to fetch a cup of coffee at Smouzen which is in the middle of town. Hope you'll be able to join! Gelderse toren. Brummen, the Netherlands.